Documentation is available for the python interface library. Additionally, a demonstration Notebook is available in the Notebooks folder. For installation instructions, see below. More detailed documentation is coming soon. Meanwhile, feel free to contact us at blocksci@lists.cs.princeton.edu. How do Bitcoin markets behave? What are the causes of the sudden spikes and dips in cryptocurrency values? Are the markets for different altcoins inseparably linked or largely independent? How can we predict what will happen next? Articles on cryptocurrencies, such as Bitcoin and Ethereum, are rife with speculation these days, with hundreds of self-proclaimed experts advocating for the trends that they expect to emerge. What is lacking from many of these analyses is a strong foundation of data and statistics to backup the claims. 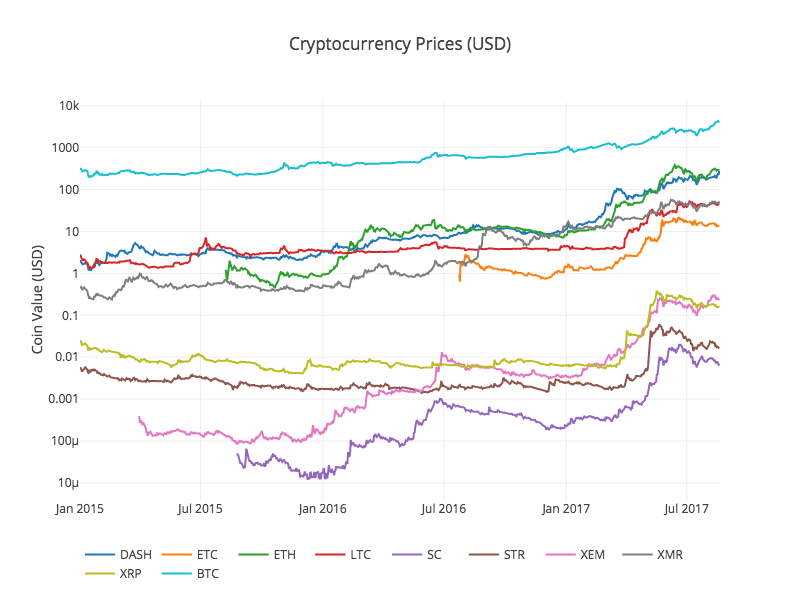 This is not a post explaining what cryptocurrencies are (if you want one, I would recommend this great overview), nor is it an opinion piece on which specific currencies will rise and which will fall. Instead, all that we are concerned about in this tutorial is procuring the raw data and uncovering the stories hidden in the numbers. Does it sound familiar to you? In order to get an idea of how to choose a parameter for a given classifier, you have to cross reference to a number of papers or books, which often turn out to present competing arguments for or against a certain parameterization choice but with few applications to real-world problems. For example, you may find a few papers discussing optimal selection of K in K-nearest Neighbour, one supporting so-called square-root of sample size N method, another talking about selecting K based on how well the classifier performs according to its cross-validation samples. The parameterization choices have signficant impacts on the performances of classifiers; so it’s important to get them right. Parameterized differently, as shown in the paper below, the performances of each of the 8 most popular classification algorithms can be significantly different. The following 51-page paper introduces 8 most popular classifiers in Machine Learning and illustrates each with an example based on financial data from real world. It can serve as a guide for how to apply Machine Learning Techniques to solve problems faced by finance industry： https://ssrn.com/abstract=2967184. Please see the presentation slides that present a summary of classification techniques used in finance industry: https://ssrn.com/abstract=2973065. Advanced mathematics and statistics has been present in finance for some time. Prior to the 1980s, banking and finance were well known for being “boring”; investment banking was distinct from commercial banking and the primary role of the industry was handling “simple” (at least in comparison to today) financial instruments, such as loans. Deregulation under the Reagan administration, coupled with an influx of mathematical talent, transformed the industry from the “boring” business of banking to what it is today, and since then, finance has joined the other sciences as a motivation for mathematical research and advancement. For example one of the biggest recent achievements of mathematics was the derivation of the Black-Scholes formula, which facilitated the pricing of stock options (a contract giving the holder the right to purchase or sell a stock at a particular price to the issuer of the option). That said, bad statistical models, including the Black-Scholes formula, hold part of the blame for the 2008 financial crisis. In recent years, computer science has joined advanced mathematics in revolutionizing finance and trading, the practice of buying and selling of financial assets for the purpose of making a profit. In recent years, trading has become dominated by computers; algorithms are responsible for making rapid split-second trading decisions faster than humans could make (so rapidly, the speed at which light travels is a limitation when designing systems). Additionally, machine learning and data mining techniques are growing in popularity in the financial sector, and likely will continue to do so. In fact, a large part of algorithmic trading is high-frequency trading (HFT). While algorithms may outperform humans, the technology is still new and playing in a famously turbulent, high-stakes arena. HFT was responsible for phenomena such as the 2010 flash crash and a 2013 flash crash prompted by a hacked Associated Press tweet about an attack on the White House. This lecture, however, will not be about how to crash the stock market with bad mathematical models or trading algorithms. Instead, I intend to provide you with basic tools for handling and analyzing stock market data with Python. I will also discuss moving averages, how to construct trading strategies using moving averages, how to formulate exit strategies upon entering a position, and how to evaluate a strategy with backtesting. Call an open position a trade that will be terminated in the future when a condition is met. A long position is one in which a profit is made if the financial instrument traded increases in value, and a short position is on in which a profit is made if the financial asset being traded decreases in value. When trading stocks directly, all long positions are bullish and all short position are bearish. That said, a bullish attitude need not be accompanied by a long position, and a bearish attitude need not be accompanied by a short position (this is particularly true when trading stock options). Here is an example. Let’s say you buy a stock with the expectation that the stock will increase in value, with a plan to sell the stock at a higher price. This is a long position: you are holding a financial asset for which you will profit if the asset increases in value. Your potential profit is unlimited, and your potential losses are limited by the price of the stock since stock prices never go below zero. On the other hand, if you expect a stock to decrease in value, you may borrow the stock from a brokerage firm and sell it, with the expectation of buying the stock back later at a lower price, thus earning you a profit. This is called shorting a stock, and is a short position, since you will earn a profit if the stock drops in value. The potential profit from shorting a stock is limited by the price of the stock (the best you can do is have the stock become worth nothing; you buy it back for free), while the losses are unlimited, since you could potentially spend an arbitrarily large amount of money to buy the stock back. Thus, a broker will expect an investor to be in a very good financial position before allowing the investor to short a stock.